A food blog about restaurants in and around Salt Lake City, Utah. Ryan Kendrick's words and photos. I’m going to keep this one brief, but I felt it merited a follow-up. Back a few years ago (ok, maybe quite a few more than that), I was a mediocre little league basketball player. The only hot streak I ever had was the record number of consecutive games in which I would warm the bench. Of course, at the end of season awards ceremony, I was always the proud recipient of the “most improved player” award, even though technically I probably didn’t improve and even more technically it was a stretch to even classify me as a player. But they needed to award me something, and most improved was all they had left at the bottom of the trophy pile. I wanted to post an addendum to my previous review of Johnny Slice and award their pizza the SLCeats Most Improved Player award. Except unlike my little league awards, this one is actually merited. It pained me in my initial review to praise the pizza place for everything except, well, the pizza. Truth be told, it wasn’t that great and I wasn’t a very big fan. But to their credit, it appears that ownership listened and made the necessary course corrections, because in the numerous times I’ve been since, their pizza has improved remarkably and is now among my favorite slices in SLC. The buffalo chicken pizza, laced with bleu cheese, is my new favorite. Anyways, that’s it. Credit where credit is due. Johnny Slice is making some mean pizza now. Go and enjoy. In its ongoing effort to transform itself into a social and entertainment hub distilling all the best that downtown Salt Lake City has to offer, The Gateway has announced that they’re adding MidiCi, The Neapolitan Pizza Company, to its growing tenant roster. MidiCi has made a name for itself by offering authentic Neapolitan thin crust pizza, baked in handmade wood-fired ovens imported from Italy—right in the center of its restaurants—so that patrons can see exactly what goes into everything they make. From an extensive menu full of fresh and natural ingredients to a robust wine, beer, dessert and espresso selection, it’s all part of an authenticity and care that they bring to everything they offer. MidiCi will be opening in late 2017 as part of The Gateway’s new “restaurant row,” on the south end of the property. Throw a rock in any direction from Main Street in Salt Lake City and you’re bound to hit a pizza shop. Actually, you’re bound to hit many pizza shops. Off the top of my head, I can think of Este, Eva Bakery, Pizza Studio, From Scratch, Settebello, Oak Wood Fire, Pier 49, Pie Hole, Sicilia, and Maxwell’s. No, Sbarro doesn’t count. And I’m sure I missed a couple. Needless to say, downtown pizza choices abound, and while each shop offers very different styles of pizza, from thin crust at Pie Hole and Este to thick slices at Pier 49, I was a bit surprised to hear that a new pizza place, Johnny Slice, opened right across the street from Sicilia and down the street from Oak, Pier 49, and Maxwell’s. That said, Johnny Slice isn’t looking to be pigeonholed as just a pizza joint, as they seek to differentiate themselves with broad menu offerings. Breakfast sandwiches, coffee, pasta, salads, hot and cold sandwiches, and desserts are all served in this light and open space dominated by striking black and white tiles. The owner of Johnny Slice is also the owner of Michelangelo Ristorante on Highland Drive (but not the restaurant of the same name just up Main Street), so the breadth of Johnny Slice’s menu is not uncharted territory for these restauranteurs. Their kitchen serves up breakfast sandwiches like a sausage and egg, bacon and egg, veggie, and ham & cheese. Breakfast is served all day, and you can wash it all down with a hot coffee or a freshly pulled espresso. At $5.75 for a sandwich, it seems a bit on the steep side for an early morning bite on the way in to the office, but the sandwiches aren’t tiny, either. The French toast is made with house-baked focaccia, cinnamon, powdered sugar, and real maple syrup ($6.75). Add a side of warm berry sauce for another 75 cents. A dining companion reported that the French toast was tasty and was cooked well, and just what you would expect from French toast: soft on the inside and with a nicely griddled crust. Pizza can be ordered by the slice, or whole pies can also be ordered. By the slice pizzas are waiting and ready to be warmed upon order. I think the pizzas are good. Not great, but good. Pizzas range from your standard cheese, pepperoni, and Hawaiian, and branch out into more creative territory with their Mediterranean (white sauce, bacon, garlic, spinach, feta, tomatoes, red onion, kalamata olives, and roasted red peppers) and PP&J (pepperoni, pineapple, and jalapeño). I tried a variety of slices and found the sauce to be a bit one-dimensional and too acidic for my tastes, while the pizza crust was decent, but a bit too reminiscent of a bagel in the chewiness department. At the end of two pieces my jaw feels like it just completed a set of bench presses. A little crunchier and a little less chewy would work wonders. Their version of the roast beef sandwich was a real standout. Thin-sliced deli roast beef is heaped onto a fresh hoagie roll, topped with a generous portion of roasted peppers, caramelized onions, Swiss cheese, and parmesan cheese, and placed into the oven to get all melty and crispy. The sandwich ($8.50) is served alongside a pickle and a delicious cup of au jus that is a perfectly salty, beefy accompaniment to the rich and hearty sandwich. You can also jazz the sandwich up further by topping it with an assortment of peppers and giardiniera from their condiment bar. A combo option for $2.50 adds a bag of chips and a soda, but unless you just returned from a Strongman competition you’re not going to have room. This sandwich is hearty, and packs a deliciously agonizing gut-punch that will have you questioning your life decisions for a few hours after. I recommend it 100%. I have only visited during lunch hours, but they seem to understand the importance of quick turnarounds during the crazy downtown lunch rush. Every time I have stopped by, the kitchen has been staffed with no less than 5-7 employees, a kitchen manager expediting, and an extremely friendly and helpful restaurant manager running food and bussing tables. Pizza slices and sandwiches show up within five minutes. Prior restaurant experience shines through in their service during the lunch rush. Unfortunately, dining buddies have reported this same prompt service to not quite be the case on nights and weekends, where an order of French toast and an egg sandwich took about 30 minutes to arrive, and an order of spaghetti and meatballs on another night took about the same amount of time. Johnny Slice is serious about being open when it counts, opening at 7:30 during the week, closing at 11pm and remaining open until 2am on the weekends. Capturing the after-bar crowd will allow them to shine long after other pizza joints have closed up shop for the night. 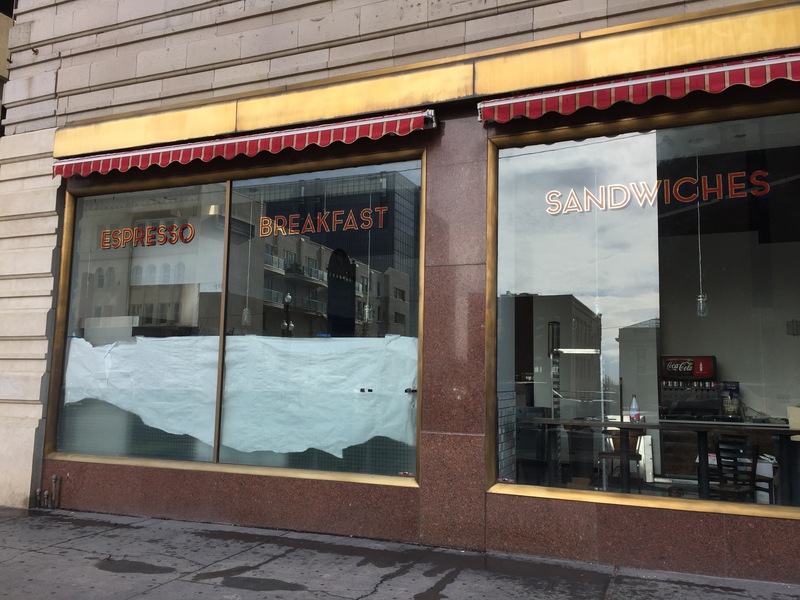 Some serious money seems to be invested into the remodel of the old Pepper’s sandwich shop, showcasing a brand new kitchen, a large, open, bright dining room, and beautiful hand-lettered signage on the windows. I really love the black and while tiles throughout, as it makes me feel like I’m in an old-school pizza parlor. The dining area is spacious, and could easily accommodate a band for some extra weekend fun. Additionally, you can reserve a private dining room for parties, which seats 12. It’s obvious through the quality and details in the remodel that the owners care about the space, care about downtown and intend to be here for a long time. 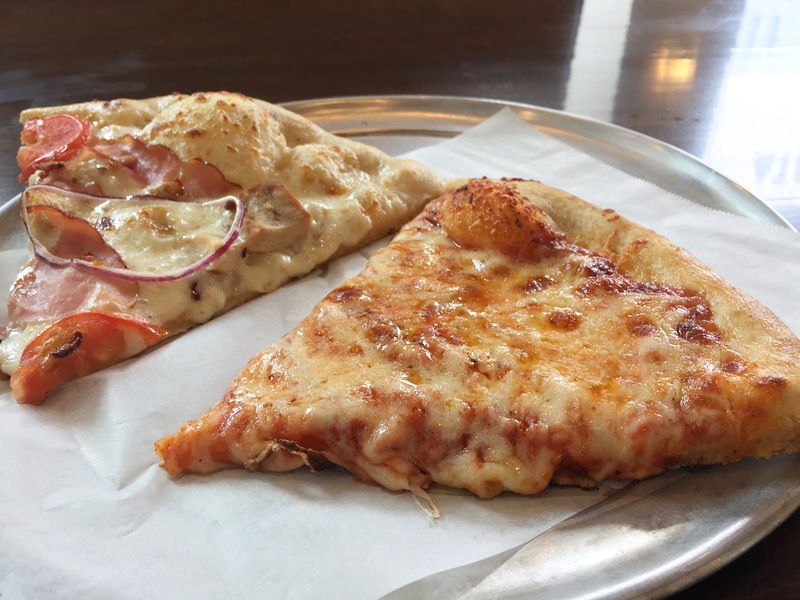 With pizza and dining choices abounding in downtown Salt Lake City, Johnny Slice is a delicious and worthy addition. A new restaurant looks to be just about ready to open up near Main Street and Broadway (12 West 300 South). There is not a ton of information available, it appears they will be a pizza-centric quick-stop restaurant, with hot sandwiches (pulled pork, sausage and peppers, and turkey) on the menu as well. 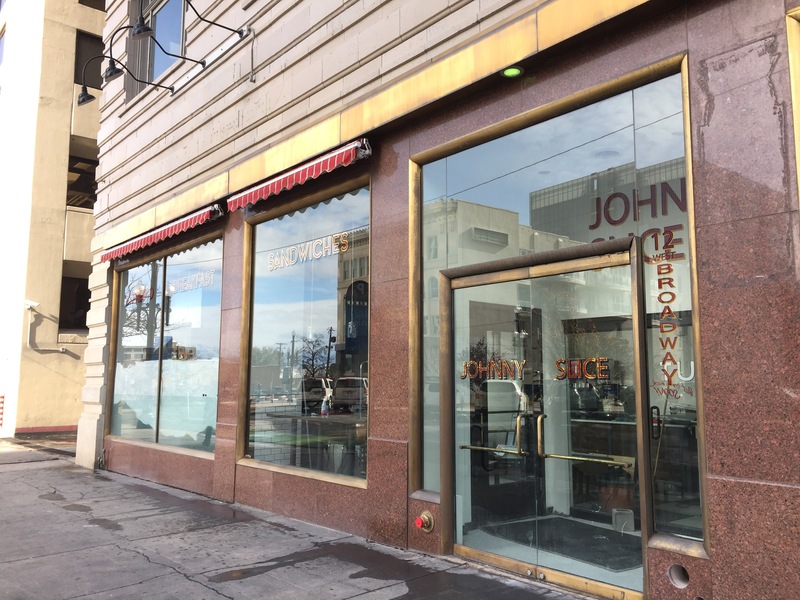 Johnny Slice will also serve coffee, breakfast, salads, and pasta. Prices seem reasonable and priced for the downtown lunch crowd. $3.25 per slice, $8 for sandwiches. I’ll post more info when I get it. A new restaurant will be opening soon on Gallivan Avenue across from Bangkok Terrace. From Scratch will focus on just that: fresh breads, pizzas, and baked goods made from scratch. So much so, that the owner has imported his own wooden flour mill from Austria to mill his own flour. Tables are made from old butcher blocks, art was commissioned from a NY artist, and lights are custom creations. I really like the look of this place. It has a certain “San Francisco” styling that you don’t see much in SLC. As a downtown worker, I’m especially excited about the bar where single diners can plop down for a quick lunch. From Scratch will be open for breakfast and lunch only to begin with. A special section of the restaurant will serve take-out items like espresso, in-house pastries, and house-made ice cream. The owner hopes to open for dinner later in the year, and plans to pursue a liquor license. One of my favorite meals is margherita pizza. There’s something about the simplicity of it all that really appeals to my taste buds. The fresh, creamy mozzarella, the acidic tomato sauce balanced perfectly with just the right amount of sweetness. The bright and fresh bits of basil, and the crunchy, chewy crust. Simple perfection. I decided to give it a shot at home. I found a recipe at Epicurious and adapted a few items. I added thinly sliced tomatoes and about ½ cup of shredded parmigiano reggiano to the list of toppings. I also added the prosciutto-like coppa, made by one of my favorite local companies, Creminelli. Also, next time I’ll spend a little extra and buy San Marzano tomatoes instead of the normal canned stuff you find at the grocery stores. If you haven’t had San Marzano tomatoes, they’re sweet little red bits of heaven. If you have had them, then you know exactly what I’m talking about. Very low acidity and a high level of sweetness. Also, get the “real deal” mozzarella if you can. Avoid the powdery, shredded stuff. Ask your local grocer if they carry fresh mozzarella. Usually it’s ball-shaped and packed in liquid to keep it fresh. At my local grocer, Harmon’s, a ½ lb ball runs about $5. Or you can be really brave and make your own. A few tips: get your oven as hot as it will go. 500 degrees is usually the max for most conventional ovens. You’ll want to plan plenty of time for the pizza stone to get hot. Just because the oven is preheated and ready doesn’t mean the pizza stone has reached the right temperature. So give it a good 20 minutes once the oven is preheated before you throw the pizza on the stone. The recipe suggests parchment, but parchment is typically only rated up to 420 degrees, so you’ll be dealing with some seriously burned paper if you use it. Instead, I used generous amounts of corn meal, and slid the pizza from a baking sheet with corn meal to the hot pizza stone. It worked ok, but I had to wrestle with the floppy pizza dough to convince it to get off the baking sheet and move on to the pizza stone. I imagine a pizza peel is in my near future. If you don’t have a pizza stone, do yourself a favor and get one. It produces beautiful, crisp crusts that you can’t get using baking sheets. Give this recipe a shot and let me know how it goes! I know it certainly fed my pizza craving. 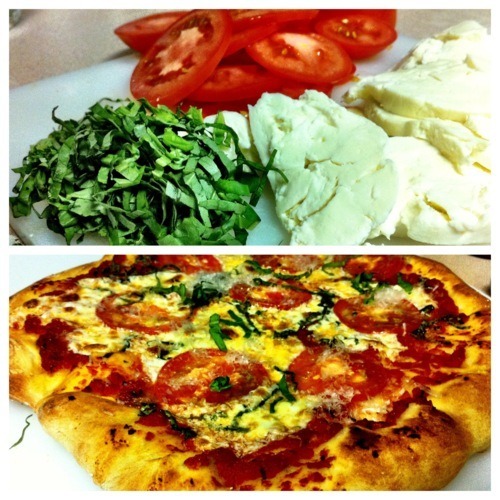 Spedelli’s recently opened in the spot previously occupied by Davanza’s on Foothill. 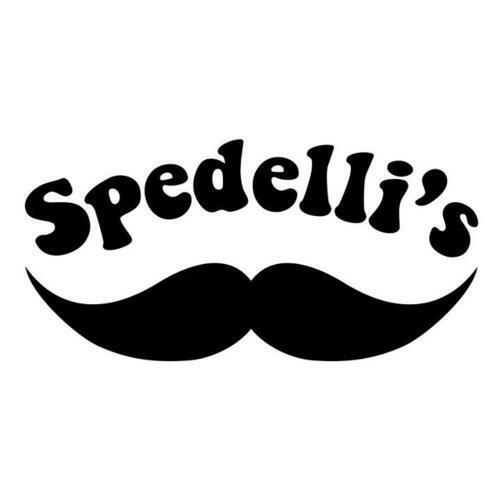 Spedelli’s is the child of Mac and Sam Spedale, who have both worked in the restaurant industry for several years. Spedelli’s will be serving up a wide selection of dishes, but specialize in tacos, salads, pizza, and wings. They will also be serving wine and beer. So far they are getting great reviews on Urbanspoon and Yelp. I couldn’t find a website, but their Facebook page is here. One of my favorite pizza places in Salt Lake, Sicilia Pizza, has relocated from their old location east of State Street. Amro has moved his business to 35 W 300 S, right across the street from American Towers. The new place is brighter, more modern, and has two floors of dining space. I just hope that his recipes weren’t lost in transit, because he has some of the best crusts and sauces in Salt Lake.